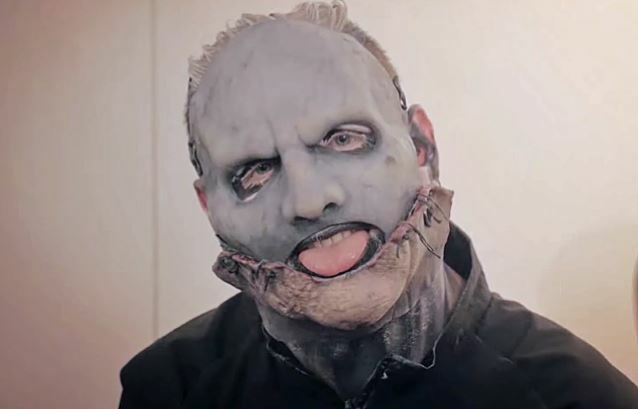 Sofie of Studio Brussel conducted an interview with SLIPKNOT singer Corey Taylor when the band played at the Graspop Metal Meeting in Dessel, Belgium on June 20. You can now watch the chat below. Speaking about how he keeps up with SLIPKNOT's busy touring schedule, Taylor responded: "I work out at home and I work out on the road when I can. But, I mean, all you can do is just kind of take care of yourself. This is coming from the guy who smokes cigarettes and drinks coffee. Yeah, I'm a real guru when it comes to health." Asked why it is that so many rockers have quit drinking and doing drugs and are leading such healthy lifestyles nowadays, Taylor said: "Ah, I don't know. They probably got bored. I mean, I quit drinking. I quit everything; I'm sober. I still eat giant steaks and French Fries and all kinds of garbage. But, you know, it's about staying healthy. It's about going where your mind is, not just the way your body is. When I hit 40, I was, like, 'Oh, time to get back into shape.' And I never looked back." As previously reported, Taylor said in a new interview with RockSverige.se that the band will take a "couple of years off" after completing the tour cycle for its current album, ".5: The Gray Chapter". Taylor explained, "We're gonna finish touring and then we're gonna take a couple of years off again to let everything chill. I'm gonna go do my thing, [and] everybody else's gonna go do their thing... then, in a couple of years, we'll get back together and see what happens again." Taylor's "thing" is STONE SOUR, which has two more covers EPs in the works following this spring's "Meanwhile In Burbank… Taylor told The Pulse Of Radio that his attention next year will turn toward an all-new STONE SOUR set. "2016, I'll probably wrap up touring with SLIPKNOT, you know, around — like somewhere around this summer or whatever, and I'll take five minutes off and we'll start working on a new STONE SOUR album," he said. Following the "Meanwhile In Burbank…" EP, STONE SOUR plans to release two more EPs of cover songs in the near future, with the first one titled "Straight Out Of Burbank" and the second called "No Sleep 'Till Burbank". STONE SOUR's last collection of original music, "House Of Gold And Bones", was a double concept album released in two parts in 2012 and 2013. SLIPKNOT's "Summer's Last Stand" tour kicks off on July 2 in West Palm Beach, Florida, wrapping up six weeks later on September 5 in Dallas.